This winter, a 53 year-old woman died overnight in minus 32-degree temperatures, frozen to death on the streets of downtown Winnipeg. This tragic and preventable loss serves as a reminder of how Winnipeg is failing to support people who need it the most and that the homelessness crisis affects women. A new study released today renews calls to action to deal with this tremendously unjust situation. 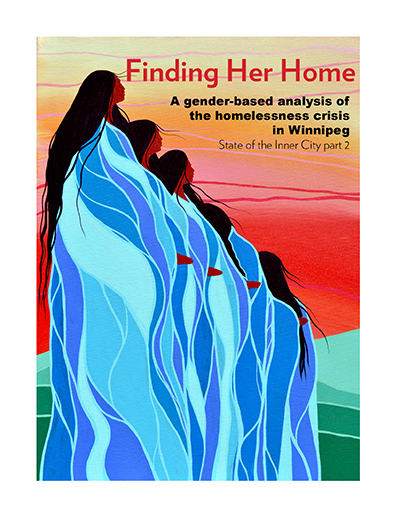 In 2016, community-based organizations asked the Canadian Centre for Policy Alternatives Manitoba office to coordinate a study on women’s experiences of homelessness. It was noted that the province was celebrating 100 years since some women had received the right to vote; however, many women continue to experience marginalization, particularly when it comes to housing and homelessness. The results of this study, Finding Her Home, renew the call for more public investment and coordination across government and community to end homelessness. A gender-based analysis when applied to program and policy development considers the intersections of gender, race, class, sexual identity and other factors. This is important since a “gender-blind” approach – looking at men and women’s experiences together – tends to overlook the unique experiences and needs of women. There are many documented cases of such “gender-blind” approaches not working for women – from health conditions to drugs tested only on men – that leave women behind. Homelessness is no different. Women’s homelessness in Winnipeg is not well understood, in part because women experiencing homelessness are more likely to be hidden via overcrowded stays with acquaintances, friends or family, rather than stay in emergency shelters. We spoke to 30 women who’d experienced homelessness and many said they do not access the existing shelter system due to safety concerns. Indeed there are few safe places for women experiencing homelessness to sleep at night. Women’s role as caregiver and mother, intersecting with race and poverty, leads many women to avoid accessing formal services. Colonization led to inter-generational traumas among Indigenous families that continues to this day. Women with addictions struggle to get help and fear their children being removed from their care. Substandard housing options for low-income women contribute to cycles of housing insecurity. The root causes that make women vulnerable lie in a lack of economic options, inter-generational trauma, a need for social supports and healing. Women continue to experience gender-based violence and report discrimination in the housing sector, which is a particular concern for trans women and women of colour. The legacy of colonization manifests itself as an overrepresentation of Indigenous women experiencing homelessness in Winnipeg: 84 percent of women who are homelessness according to the 2015 Street Count. The vulnerabilities that have led to the loss of so many mothers, sisters and daughters; the inquiry into Murdered and Missing Indigenous Women and Girls is connected to the reality of homelessness for many women. Women’s involvement with governmental systems can be a pathway to homelessness when they fall through the cracks that result from uncoordinated systems. Women receiving Employment and Income Assistance (EIA) are vulnerable to homelessness if their children are apprehended by Child and Family Services (CFS) as this can lead to a reduction in their housing allowance, making them unable to pay rent. As one of the participants in our study stated, “the day I lost my kids, that’s the day I was homeless… and I was homeless for a couple years.” Once women lose their housing, it becomes significantly more difficult to reunify with their children. Research found that existing services are often siloed and not tailored to women’s needs. Resources and services that can prevent homelessness for women need to work in harmony to prevent homelessness; this includes EIA, CFS and Corrections. Housing First, as it has been implemented in Winnipeg, is a narrow approach geared to a portion of those who experience homelessness and does not stream equal numbers of women into Housing First programs. Community-based organizations are advocating for a continuum of supports and housing options, using a harm-reduction approach, to women and their families. The solutions are within reach; what is required is sustained and focused action to remedy these challenges. When it comes to finding the solutions to women’s homelessness, there is a need for more government investment in rent-geared-income social housing with built-in social supports. Women experience racism and discrimination in the housing sector and this should not be tolerated – tenants need support to be able to advocate for their rights. Women are particularly vulnerable to violence and need safe places to go and the community agencies that provide women with critical basic needs and relational support need consistent, long-term funding. Women who have experienced homelessness emphasize the need to create a women-only, 24 hour safe space that can provide resource support and interim housing. A women-centred strategy to work alongside the 10 Year Plan to End Homelessness that is housed at End Homelessness Winnipeg is required in order to address the gendered cycles of housing insecurity and homelessness. 101 years after some women got the vote in Manitoba, we need to work intensively and persistently to end vulnerabilities for women in our city.